Okay! I'm on a roll now. I've been managing to do a painting a day for the past few days, and I can already see an improvement in my work. It's much looser, more "painterly," and just a lot more fun. It's still scary as ever, but I'm just forcing myself to paint, no matter what. I just have to do it -- and hope that it's something I can let the world see -- well, anyway, anyone who might see my works in the few venues that I show it, anyway. This little dog is just beautiful to me. She didn't happen as easily as the previous painting did, but she finally came together. Took me most of the day, though. I often wonder if other, more experienced, more schooled painters have to spend all day doing just a simple portrait like this. Maybe I'll learn some "tricks" if I keep up my daily paintings again this time. I think in a few days I'm going to try something besides a dog. I've got quite a few people waiting to get their dogs painted, but sometimes I just need to take a break and try something entirely new. I think it will help keep me fresh. I took some photographs a few days ago of some magnificent trees down in Corvallis, OR, that I really want to try my hand at. Yes, that's what I'll do, paint some trees. But not tomorrow or the next day because I really do have some people waiting for paintings of their dogs, and I want to get those out of the way first. I know how hard it is to try to wait for something you're really, really excited about seeing. 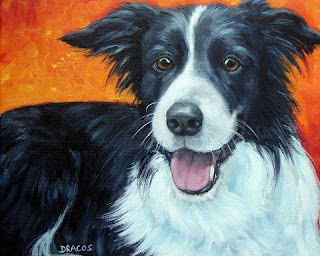 And one of the paintings is for someone who's recently lost his precious dog. I did one of her already, but I want to do another one, too, before he sees either of them. I'm stalling on the second one. Maybe I'll finish it tomorrow. Awwww! Isn't this one cute? I just love it. And I didn't let myself work it to death, either! That's what I usually do, work one until it starts to lose life and spontaneity. It's a new (old, rehashed?) promise I'm making to myself: I have one job and one job only, to do a single painting a day. It doesn't have to be good; it doesn't have to be elaborate or grand; it just has to be done! I've got to get over this fear of failure, and this has got to work! If they're too awful, I can throw them away. If they just don't look good enough that I would want anyone to see them but not awful enough to throw away, I can put them in a stack and maybe work on them again another day in the indefinite future. But this little guy, I'm happy with him. I think he's fresh, pretty, and has lots of personality -- just like my Henry Higgins (my shih tzu who's lying underneath me as I write this) after whom he's modeled. I had to do some guessing, though, because I adopted Higgins when he was already around six years old. He's a ripe old 9 or 10 today and going strong, too, I might add. As with all my paintings, this one will be available on my website, www.dottiedracos.com, or www.wildwildthings.com (both addresses take you to the same place). Okaaay! I'm finally starting to get this! I'm very pleased with this guy. And he practically painted himself. I think forcing myself to paint through my fears is working and I'm actually becoming a better painter. Funny, though, as always happens, in a few months I'll look at this painting, too, and see all the flaws. But that's a good thing, isn't it? It means I'm growing. Who woulda thought that at my age I would feel like a little child who is learning something new and is so very excited (but in my case, awfully, awfully fearful, too) about it. 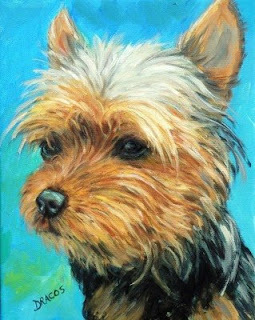 And for those of you out there who think that "just painting dogs" isn't much of a challenge, I've spent a large part of my life in universities and graduate schools, studying what I thought would end up being my life career, neuroscience/psychology. That was really, really hard, but it doesn't even halfway measure up to what I'm doing now, both in difficulty and challenge but also in just the thrill of getting to do this marvelous "work" every single day. Okay, nuts and bolts now: This is an acrylic painting on gallery-wrapped canvas, 11x14x3/4", with the sides painted dark red, wired and ready to hang. It's $200, plus shipping, and may be sold. 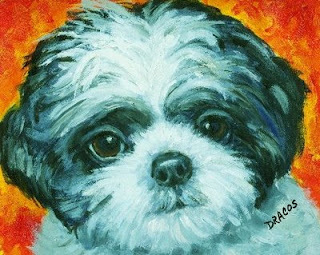 I'm doing two paintings of the same dog for a person who took my challenge to send me photos and let me do the painting and let her either buy or not buy the painting(s). As soon as she's made her decision (I give people one week to do so), if she choose only one, both, or none at all, I'll let the rest of the world know. But prints and clocks will be for sale, no matter what. He's a pretty little thing. I found his "hairiness" to be especially difficult, though. I need to practice "hairy" dogs more to get more of a feel for how their abundant hair lies -- or doesn't!!! Anyway, it was a pleasure and a challenge to be able to paint this little guy. He'll be up in about a week for sale on my website. He's on an 11x14 gallery-wrapped canvas. Well, I'm back to painting daily again -- and it feels good! Getting more confidence in my painting. 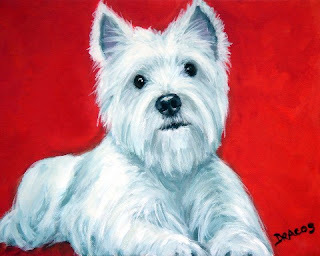 This is a Westie, or West Highland White Terrier. I see why it's affectionately called a Westie with a long name like that! Anyway, it's acrylic on an 11x14x3/4" canvas, with the sides painted red, and is wired and ready to hang -- or frame if you wish. It's $200 plus shipping and is now available on my website, www.dottiedracos.com. I'm working on a couple of yorkies that'll be listed tomorrow and the next day.